Siena is home to an eclectic mix of Architecture ranging in style from Gothic to Romanesque style buildings. The Siena Cathedral is particularly interesting, this is a stunning example of the hilltop city’s architectural stew, with this stand alone building displaying stunning examples of both Roman and Gothic architecture. What’s even more interesting about this building is the mix of architects that were involved in its design. Siena’s Duomo was began construction in the 13th Century when it was designed in part by Gothic master Nicola Pisano. His son, Giovanni, drew up the plans for the lower half of the facade. The facade’s upper half was added in the 14th century. The construction of the building was halted during the 14th century when the black death wiped out four fifths of the city’s population and no further work was done on it until the 19th century when it was extensively restored with the addition of a golden mosaics.The Cathedral is home to a number of beautiful works of art, including ones by Pisano, Donatello and Micelangelo as well as frescoes by Pinturicchio. The Torre del Mangia tow er is an endlessly fascinating piece of architecture. Not only is it beautiful to look at, it’s also subject to a number of interesting facts. 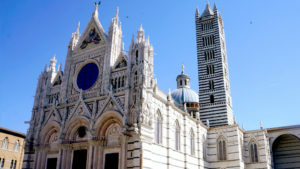 A marvel of 14th Century architecture, the secular tower was designed and built to be the same height as the Duomo di Siena as a living example of the church and state sharing equal amounts of power. The tower which translates roughly as “Tower of the eater” gets its name from the the first Guardian of the tower. This man was said to be a great lover of food and so spent a good deal of his income indulging his interests and so he was nicknamed “mangiaguadagni” the name given to someone who eats their earnings. Well, if we lived in Siena, we probably would too! 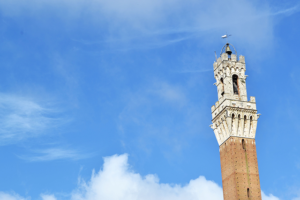 The 88 feet tall tower gleans spectacular views of Siena and the surrounding countryside and is open to the public for the small price of 400 steps, plus entrance fees. The Tower has been replicated all over the world in cities such as Birmingham and Connecticut and is said to be the inspiration for many other pieces of architecture. Tuscan food is a cuisine unto its own. The region has championed the concept of peasant food. A cuisine characterised by comforting and wholesome food fmade using with the cheapest and most accessible ingredients. Italians are artists of food and with a bountiful selection of fruit and veg as their pallet, their creations seldom disappoint. From warming Ribollita soup to perfect bruscetta and the classic Pappa al Pomodoro. Truffle hunting is a long standing tradition in the Tuscan countryside. Traditionally pigs were used to sniff out the precious fungus but nowadays its done by specially trained dogs. Truffle dishes can come in various forms, ranging from Tagliatelle and Ravioli to pizza topping and oil. There are a number of different varieties of truffle, San Miniato is the undisputed capital of the famous white truffle Tuer Magnatum Pico which comes into season in the Autumn months. enjoy … la dolce vita!